I have happily entered and saved a test publication on Mac- but whatever I do, when I seek to print it, nothing appears on paper. I transferred the contents to my copy of Pageplus (on Windows)and told that to print it - and no problem. When I select print on Publisher, the usual screens appear but the preview on screen of the print has the right number of pages but is bland - and that is how the hard copy turns out. What can I be doing wrong.If I try to save my Publisher text as pdf, again, the right number of pages appears - but no text. This has been reported a number of times here and here and others. As far as I know ( @Chris_K can you confirm?) we have not replicated this yet, so please attach a file that does this for you and tell us what printer you are using. Thank you for your speedy response, Patrick. I am attaching the files I have been using. It may be helpful if I tell you thatI have downloaded the Beta in windows version to the same computer (I am using Parallels Desktop to run Windows on my MacBook Pro) and the file that would not print with the Mac version of Affinity Publisher Beta happily prints with no problem on the same printer that will not print from the Mac version. Have the same issue. Printing to HP1215 colour laser. Just imported a.ppp file via PDF bit of a faff but has worked. Normally before printing transfer file into picture at highest PNG (32 bit depth) but cant find how to do this in AP, so wanted to print to see if printing is acceptable for our chocolate wrappers. Just blank paper and our printer then has an error message??? I reported printing problems with the first beta when sometimes it did and sometimes it didn't print. With this second beta I can't print anything. I'm running OS 10.13.6 and using an Epson SureColour P600 and an HP Envy 5532. With each printer the print preview window shows blank pages and nothing shows in print queue . If you press print all you gets blank pages. Am just editing this having read some replies on this forum re this problem. It appears to be linked to the scale setting on your printer. 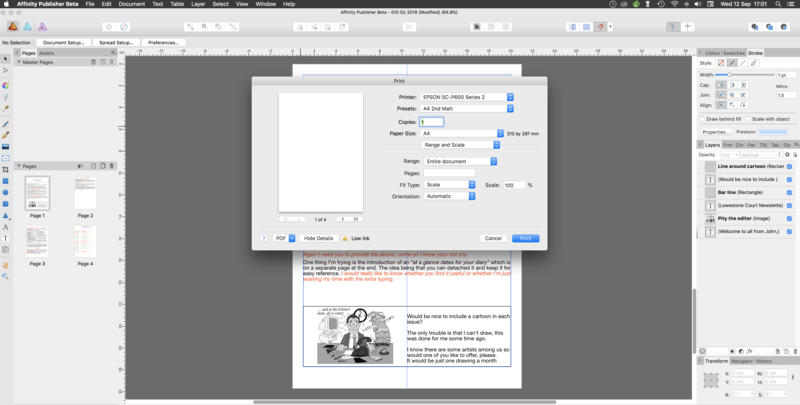 Attached are two screen shots showing my Epson drop down print menu. Were the Fit type is shown as "Scale' the preview window is blank and nothing prints. 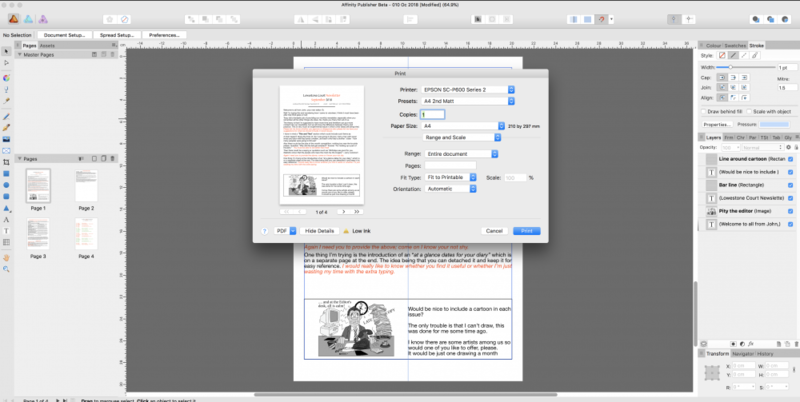 Were it is set to "Fit to printable' preview window shows page and it prints. Don't know why this is as my document size is set to A4 as is my printer. Just had the same problem and the solution posted above fixes the problem for me. Not sure why this should be so. Thank you, JHMdigital. That solves the problem for me too. I don't understand why this is as it is. It also happen with me but I am on windows 8.1. Not a single printer works properly with Pub. My printers are HP Laser Jet 1010, 1020, M1005, 1102 and Epson L110. Always provide 1st page blank then ask a duplex printing and print the design on 2nd page.